[03/22/2016 @ 5:25 PM] Book this on: Priceline, Orbitz, CheapTickets, BookingBuddy, Travelocity, Expedia, Hotwire. [08/17/2016 @ 3:43 PM] Deal is back. The details on this page were accurate when this post was last updated (see time-stamps above). Prices and availability of this deal can and will change, given enough time. This page contains links to companies that may compensate this site when you click on their link and purchase travel from their website. 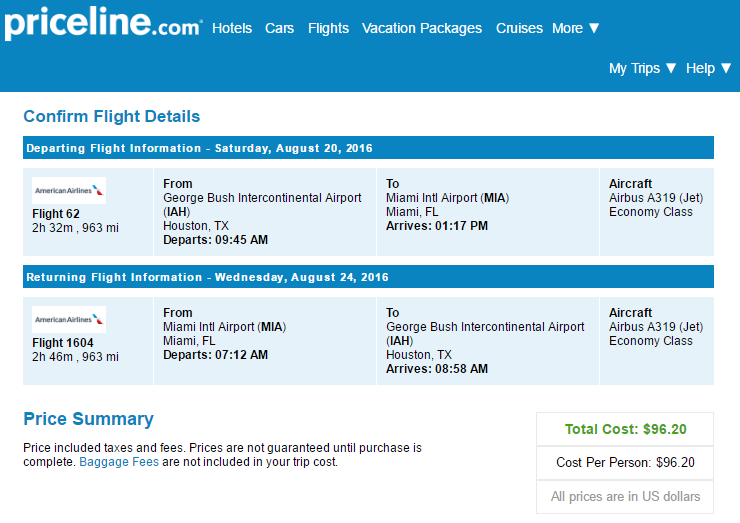 American Airlines and United have round-trip flights from Houston (IAH) to Miami (MIA) for $87-$97, NONSTOP. $44 (Midweek) $54 (Other days) each way. Flights August to October. No Fridays. Holiday Blackouts apply. Fare is reversible. Carrier will depend on dates selected. 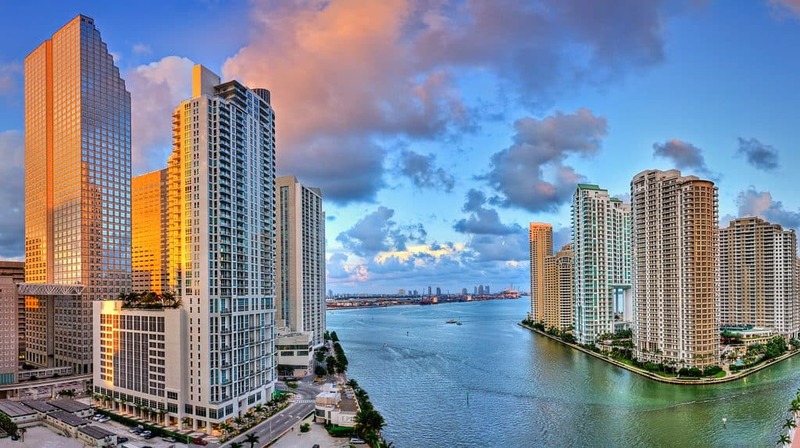 Note: When Miami goes on sale, you can usually find a matched sale to Fort Lauderdale (FLL). This may be helpful to you if the dates you want to Miami are already sold out since these airports are close together. Example Dates: Miami (Travelocity / Priceline) Sep 06 – Sep 13, 14 / Sep 10 – Sep 13 / Sep 14 – Sep 20 / Sep 17 – Sep 20 / Sep 21 – Sep 27, 28 / Other dates: Use the calendar snapshot below. Example Dates: Fort Lauderdale (Travelocity / Priceline) Sep 07 – Sep 13, 14 / Sep 10 – Sep 13, 14 / Sep 13 – Sep 20 / Sep 17 – Sep 20 / Sep 24 – Sep 27 / Other dates: United has flights in September. Before you finalize your purchase, use BookingBuddy to see if any other website or airline is offering a better deal. Prices, routes, and available dates can vary between the various booking sites. If you plan on buying travel insurance, we suggest that you buy it directly from Allianz. United is re-selling Allianz travel insurance without Change Fee protection, or Missed Connection coverage; these are two of the most useful protections you can have. By buying directly from Allianz, you can usually replicate United’s offer for cheaper, or pick up additional coverage that United has omitted. Fare availability screenshots were taken at 12:39 PM on 8/11/16. I was able to pull up this fare on Priceline, and it should be available on Travelocity as well. Screenshot taken at 12:39 PM on 8/11/16. Note: OTAs such as Travelocity and Priceline allow free cancellation without penalty within 24-hours after purchase. As deals sell-out or expire quickly, this policy will allow you to “lock-in” the cheap fare while you sort out a plan. Just keep in mind that after 24-hours, you will not be able to cancel without the regular penalty. On Travelocity, you can easily see if your ticket allows a free cancellation, just look for “FREE Cancellation” next to the button to purchase the ticket. Book this on: Priceline, Orbitz, CheapTickets, BookingBuddy, Travelocity, Expedia, Hotwire.